and came home with a few beautiful breams. I have been dying to cook one up and give it a shot. the fish was moist and spicy, came out amazing! * Make sure your bream is properly cleaned inside and outside. * Make 3 incisions on the fish (not so deep). Make the marinade by mixing the green chilli paste, some freshly grounded garlic, salt, Robertson's zesty lemon pepper, Robertson's fish spice, lemon juice, black pepper. Mix well together - rub half the mix inside the fish and mix the rest of the garlic with the leftover marinade and coat over the outside of the fish and underneath. 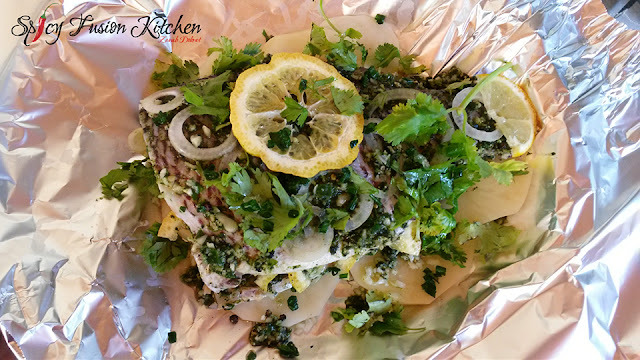 Add lemon and onion slices inside the fish. 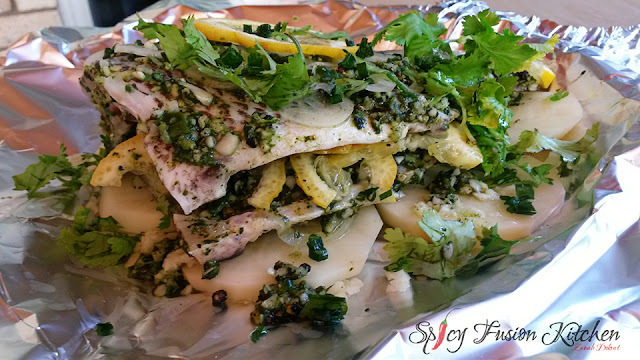 On a baking tray add a sheet of foil, add the slices of the potato slices and place the fish on top. On the fish add some onion slices and a lemon slice(s). Top with a lot of coriander and spring onions. Drizzle with olive oil, if you want you can add butter, add some water as well (don't be heavy handed). Close up the fish into a foil bag. Pre-heat the oven on a high temperature, before placing in the oven. Leave in the oven for 195 degrees, keep checking. When its close to serving around 10 minutes - grill the top to make the outside crispy (if that is what you prefer). First time I tried bream and I loved it, have to be very careful with the bones but alhamdudillah came out really good. I want to try this recipe with other fish and even chicken fillet because it came out that awesome! Looks so yummy and healthy. This is a good way to eat more fish. Fish is so healthy as long as its not drowning in oil. There are endless amount of recipes and ways of cooking fish. I have not tried bream, this dish looks so delish mashaa allah. now I have to research where I can find this fish. I have only seen the usual ones salmon, halibot, ahai tuna, ext. bream is new to me. Bream is sometimes hard to come across, if you cannot find it you can try using hake - but you wont be able to stuff it, or any fish that you can stuff will do. I have not experimented with other fish, but when I do I will update this post inshallah. Bream is also new to me, can i do it other types of fish? Alhamdulillah for the blessing of taste and healthy appetite. When you add the fresh garlic to the fish it fuses with the potato so when you eat the fish with the potato it tastes like fresh garlic potato it tastes great! Ameen we really do take advantage or don't appreciate what a blessing that is too. Honestly your blog has been really great, especially for those days where I just don't know what to make. I still want to try to make your licorice cake! Aww shukran! Really thats exactly why I started the blog, because that question is always asked in my home every night "what are we cooking tomorrow" - now no one has to ask and stress and wreck their brains coming up with yummy new dishes. Please let me know how it goes when you do, its a perfect summer dessert. Wasalam :) so sorry for the late reply, I just saw this now, weird I know! We don't always get super freshly caught fish here too because we're a landlocked country which is also going through a drought so fresh fish is quite scarce. 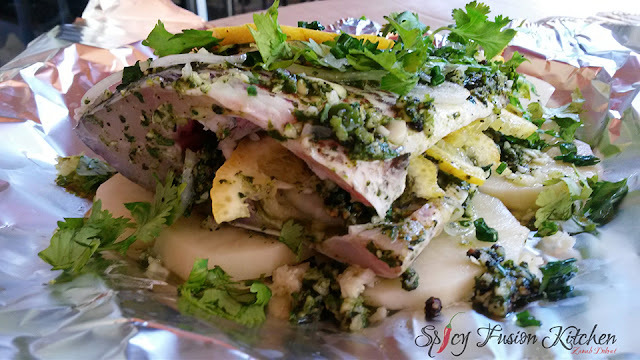 I'm not sure how your food markets are if they sell fresh fish be sure to check that out, or you can use the same ingredients from boxed (cut and cleaned) hake or soul if you really want to try this recipe, works just as best. Jazakallah so much for featuring my recipe :) makes me really happy and such a lovely surprise!